Back then, I was a lawyer ahead of schedule. 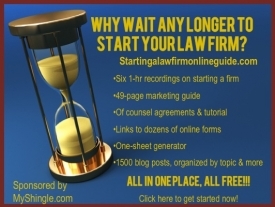 By starting my own law firm, I made partner before I turned thirty and became a business owner long before the dotcom boom of the late ’90s made entrepreneurship at once desireable and virtually mainstream. I was also one of the first law firms to recognize and harness the power of the Internet: my firm has had an email account since 1994 and with the upload of a law firm website (which I handcoded myself) in 1995, I joined the the first generation of law firms on-line and in 2002, I was part of the first generation of lawyer-bloggers. At heart, I am a practicing attorney, a solo by choice, as I note in my eponymously titled book, Solo by Choice: How to Be the Lawyer You Always Wanted to Be. Before starting my law firm in 1993, I worked for several large or national law firms and a federal government agency. When I started my firm, I continued with energy regulatory work, a specialty that I’d developed through prior employment, but also took on court appointed criminal cases, employment cases (public and private sector), Section 1983 civil rights cases and commercial and civil litigation. Since the birth of my daughters in 1996 and 1999, I’ve focused my practice on energy work, including emerging renewable energy development and compliance/enforcement issues, appeals, and civil rights litigation. To learn more about my law practice, visit my website, Law Offices of Carolyn Elefant, the trade association that I co-founded and for which I serve as regulatory counsel Ocean Renewable Energy Coalition and my law firm blog, LOCE Offshore Wind and Wave Energy Blog. In addition, I also blog at American Law Media’s Legal Blogwatch.